It’s three in a row for the Montenotte Hotel! The luxury four-star boutique hotel in Cork city has added the Hotel & Catering industry’s highest award, the Gold Medal Award 2017 for Best City Hotel, to its list of recent accolades. hospitality industry annual awards in Ireland. Having recently won Sky Bar of the Year Award for the Panorama Bistro and Terrace, as well as the Irish Accommodation Services Institute (IASI) Award, General Manager Brian Bowler was delighted to pick up the top gong at the Lyrath Estate, Kilkenny were the awards were hosted this week. “I am thrilled to accept this Gold Medal award for City Hotel on behalf of the team at the Montenotte Hotel, and proprietor Frankie Whelehan. 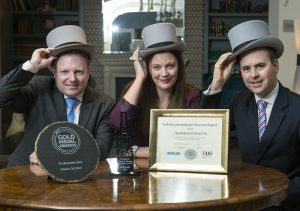 This award acknowledges our extraordinary team, our unique setting in Cork and attention to customer experience at the Montenotte Hotel,” said Brian Bowler, General Manager at the Montenotte Hotel. Following a €6 million refurbishment at the hotel, the Montenotte reopened last year, and has quickly become been a firm favourite for business and leisure guests visiting Cork. Celebrities such as Pippa and Brian Ormond, Daniel O’Donnell, Rosanna Davison among others have made the city centre hotel their home from home in the rebel county.